A few weeks ago, I wrote about how I was looking for an extension to append links to an existing note through the system share sheet. I eventually downloaded NoteBox, which has an iOS 8 extension that can quickly capture any string of text and that has a merge feature to collect separate notes into a single one. That wasn't perfect, but it allowed me to collect dozens of tweets and prepare them for a blog post on MacStories in just a couple of minutes. Updates the system clipboard with the added input text. In practice, this means that, using any app capable of showing the share sheet, you can add some text to your clipboard as a new line without convoluted steps of manual copy & paste. Want to add some tweets to a link you copied? In Twitterrific, run the workflow on those tweets and they will be added to the clipboard. Multiple links in Safari or RSS? Copy the first one as you'd normally do, then add more through the workflow. 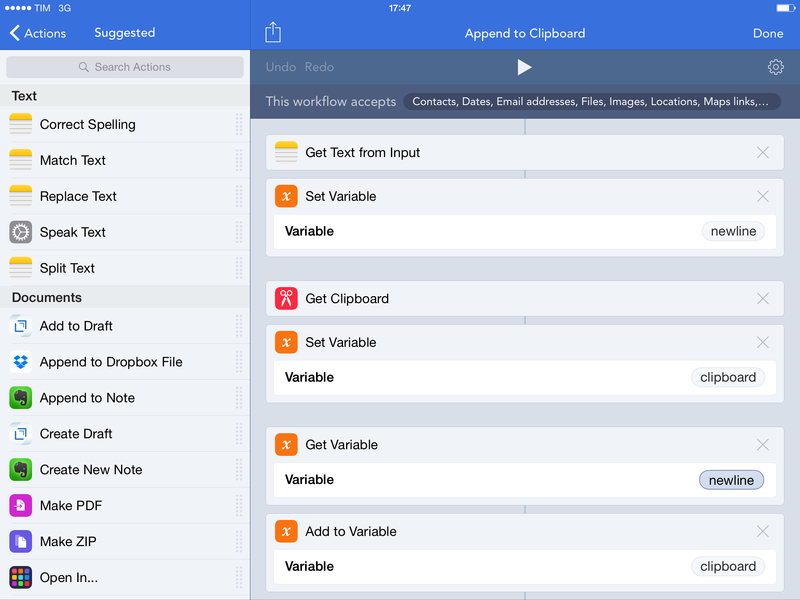 You won't have to manually merge the contents of the clipboard as long as you use the Workflow action extension to append text. I'm using this workflow every day to end up with a clipboard that contains multiple links, email addresses, or generic strings of text, and it's been a great timesaver. You can download the workflow here.